A legal watchdog group on Thursday asked the Department of Justice to investigate allegations that two senior Democratic officeholders illegally pushed federal officials to reward investors in companies to which they had personal, financial, or political ties. Investors in those companies eventually received U.S. visas through a federal program despite concerns that they were involved in illegal activities or had tried to hide sources of their income from U.S. immigration officials. Senate Minority Leader Harry Reid (D., Nev.) and Gov. Terry McAuliffe (D) of Virginia may have illegally facilitated that process at the expense of less politically connected applicants for the same program, according to Cause of Action, a conservative legal watchdog group. In a letter to the Justice Department’s Public Integrity Section, Cause of Action alleges that Reid and McAuliffe used their considerable political clout to expedite consideration of visas for investors in the SLS Las Vegas Hotel and Casino and GreenTech Automotive. 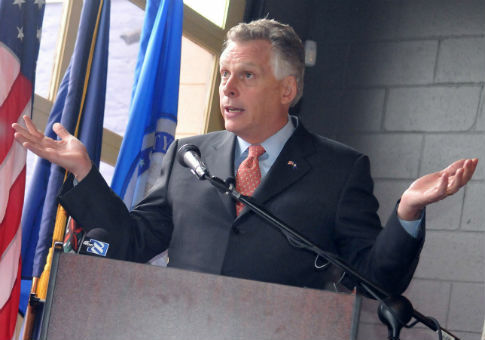 McAuliffe founded GreenTech; he resigned from the company before running for governor. The former’s parent company hired Reid’s son Rory in 2012 to help it obtain government incentives. Its executives donated thousands to Sen. Reid after its Chinese investors obtained U.S. visas. Cause of Action’s letter comes on the heels of, and relies in large part on, a report from the Department of Homeland Security’s inspector general released on Tuesday. That report revealed additional details about Reid’s and McAuliffe’s communications with Alejandro Mayorkas, then the director of U.S. Citizenship and Immigration Services, which administers the EB-5 visa program, as it is known. Cause of Action is asking DOJ to investigate potential criminal conduct by Mayorkas in addition to McAulfife and Reid. The governor’s office did not respond to a request for comment. Spokesmen for Reid and USCIS referred to their previous statements regarding the report when asked for comment. Career USCIS officials described Mayorkas’ work on GreenTech’s behalf as "politically motivated," according to the report. The IG found that Mayorkas "created an appearance of favoritism and special access" by pushing for USCIS to expedite its EB-5 applications. The report also exposed previously unknown details of Reid’s advocacy on behalf of SLS’ EB-5 investor petitions. Reid requested and received regular updates from Mayorkas and other USCIS officials on those petitions and requests to expedite them. The report suggests that Reid’s advocacy on SLS’ behalf was "substantially beyond what is legally compliant behavior," according to Dan Epstein, Cause of Action’s executive director. The IG report noted that other applicants for EB-5 visas complained to USCIS that SLS was receiving preferential treatment. One called the process "blatantly unfair" and asked USCIS officials to "look into who is getting favorable treatment before it becomes an extreme political football." Epstein said that such complaints suggest that Reid and McAuliffe advantaged EB-5 applications from SLS and GreenTech at the expense of other applicants, who were forced to wait in line while those companies saw their applications expedited. "Senator Reid and then-candidate McAuliffe may have sued their political power to … pressure USCIS employees in a way that impeded USCIS functioning as a neutral adjudicator of USCIS visas," Epstein told reporters during a conference call on Thursday. Cause of Action is asking the Justice Department to investigate whether there is probable cause to believe that criminal conduct took place. "Given the individuals involved, the pattern of malfeasance and the importance of public oversight, it is incumbent your division immediately investigate these matters," the group’s letter said. If its Public Integrity Section finds reason to believe that legal violations took place, U.S. Attorneys in the relevant states will decide whether to request an indictment. The U.S. Attorney for the state of Nevada, Daniel Bogden, owes his position to Reid’s advocacy, but Epstein said he hopes the process will be free from the type of meddling that Cause of Action has criticized at USCIS. "We hope [DOJ officials] are pursuing things based off the facts … and that those kinds of political considerations will not taint the proceedings of a fair investigation." This entry was posted in Issues and tagged GreenTech, Harry Reid, Nevada, Terry McAuliffe. Bookmark the permalink.